CONCEPT Professional Training, a global leader in online professional training in forensic mental health, announced today that it has launched a new professional online training program called Evaluation of Risk for Violence Using the HCR-20 Version 3. This training program was developed by Drs. Stephen Hart and Kevin Douglas and is presented in partnership with ProActive ReSolutions. The HCR-20 (Version 2; Webster, Douglas, Eaves, & Hart, 1997), according to a recent survey, is the most commonly used violence risk assessment measure across 44 different countries. It helps professionals in correctional, mental health, and forensic settings make decisions about who poses higher versus lower risk for violence, either within institutions or in the community, and to devise and monitor violence risk management plans. This Evaluation of Risk for Violence Using the HCR-20 Version 3 training program is primarily for criminal justice, mental health, and victim support professionals – those who work with (alleged) perpetrators and victims of violence. * Applying the HCR-20 Version 3 to actual case analysis. 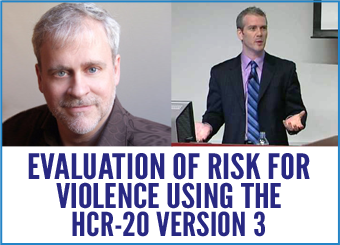 For more information on the Evaluation of Risk for Violence Using the HCR-20 Version 3, visit here.